Back home tonight from our visit with friends. Was lovely to be with them & catch up on everything. Seems you are in for a challenge, but one in which you will overcome. Jezz is there to guide you along and he will leave what he needs to so you stay on the right path. Not going to be easy but then what in life that is worth anything is easy? Hi Chez, I have gone back over all your posts left since I was last here, and enjoyed them. There is so much to consider about the origins of pain and of illness in our lives. Perhaps you are having illness to force you to move on and change your focus, but it is for you to discover and determine what, why, and how to heal. I am glad you have gotten back in touch with your friend from school, it probably means the world to her to hear from you. I was wondering whether Jezz popped in my room last night after i was lying in bed, the room was filled with a male cologne type smell, only not like someone had sprayed it, it was like a natural male smell... I don't know how to describe it. I thought it might be him as I had just said my prayers, largely about you. Do you get that when he visits you at all? What a fabulous shot of the male and female wrens. It is intereasting to hear what the wrens mean. It must be a good omen for you. Good luck. At last! I am getting back to respond to comments. There is no doubt that when Alex and the kids arrive it is 'full' on. Family is still quite young.. It is now 5.54am and I am going to go for a walk just after 6. Think I will make myself a cup of parsley tea to get me going. I love the way you hit the shopps..
Inspiring for someone that is not there by choice. If we could take a tablet for food I would be the first one to give it a go. Has Matt heard anything from the girls? There is no doubt that Christmas is a blessing when we are in the company of loving family and friends. It is always the perfect time to catch up with people that mean a lot and to honour that friendship. 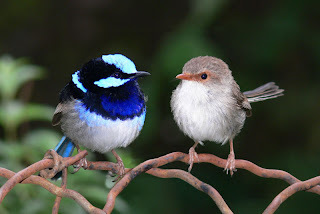 I decided to do another Post on my original BigPond Blog as I had formed friendships there that did not follow me here. This is a time that I full appreciate the value of friendship. There definitely was a message from the wrens. I was so surprised when I found them in the garden for the first time on Day of the Wren that I just knew there had to be more and it was up to me to find out the meaning. I must admit that, although this journey can be tough I am learning to live with the pain knowing that the lessons are invaluable to my spiritual growth. Lovely to see you here. I have missed your Posts and your Comments. Move on, change focus, heal. It is all there and there are messages and lessons. There is never a day that I do not give thanks for the blessings that come into my life, knowing that I have been given the most amazing insight and the ability to listen to my body. Even with the abuse and caffeine over the past two years I feel that is what I had to do. I know enough about grief to know that if I do not deal with it it will continue to reappear until I do. Or. The other alternative! It will kill me! Not ready for that. Yet!! Even thought there have been times that I thought it would be easy I know that I have work to do and a spirit to grow.. Pity that the shot of the wrens was not taken with my camera. I got it off the net. The wrens were to fast for me and we did not see a male and female together. Thankfully I am always out there seeking meaning. I still have not learned how your day went with the girls. Will check out your recent Posts now..